2 - Your smoke is just as bad for your child’s health. If you smoke, they do too. Women who smoke during pregnancy are more at risk of having a miscarriage, stillbirth babies or premature babies. The risk of Sudden Infant Death Syndrome (SIDS) is also higher among children of smokers. 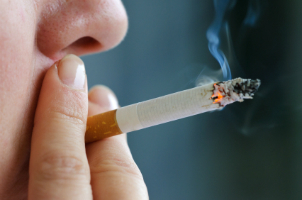 A study by the British Medical Journal shows that each cigarette you smoke reduces your life by 11 minutes. A pack of 25 cigarettes reduces your life expectancy by 4.5 hours. Remember, even when you’re kids become adults, they’ll still want you to be there for them. You are a role model. According to the Conseil québécois sur le tabac et la santé, children of smokers are three times more likely to start smoking than children with non-smoking parents. If you smoke a pack a day it adds up to almost $3,500 a year. That’s a lot of restaurant dinners, family activities or even groceries that go up in smoke. 7 - More than ever there are resources available to help you quit. Quitting is hard but you have more helpful resources at your reach: Internet sites, government programs, patches and nicotine gums. Use them. Did you know that one out of eight cut trees is used to make or wrap cigarettes? If you’re concerned about the environmentalist, you should think twice. 9 - Smoke to stay slim? If this was true, then all smokers would be thin. Get out and exercise, and play with your kids - it will keep you in much better shape! 10 - Smoking is aesthetically pleasing… guess again!